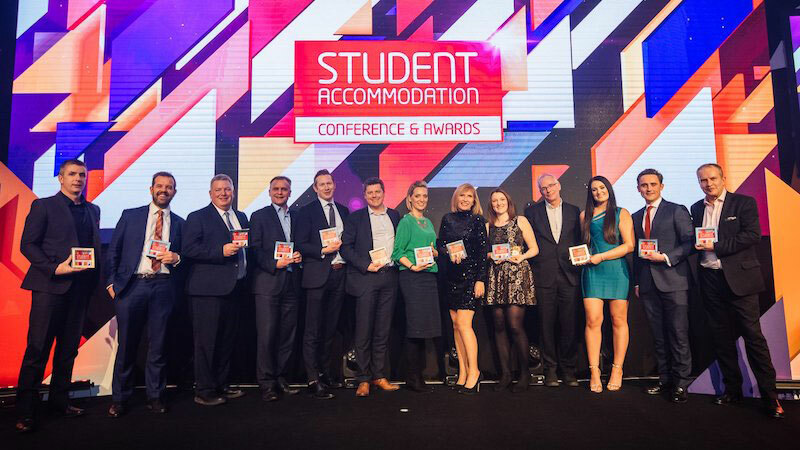 The University Quarter Housing project, a unique partnership between national accommodation provider Kexgill and the University of Hull, has won ‘Collaboration of the Year’ at Property Week’s Student Accommodation Awards, the UK’s biggest awards in the sector. Over 700 delegates gathered at the 02 Arena in London for the one-day conference, which brought together the best of the UK industry for panel discussions with keynote speakers and an exhibition hall featuring leading suppliers. The awards took place during the evening and celebrated the greatest achievements in the sector’s marketplace throughout 2018. As well as their victory in the Collaboration of the Year category alongside the University of Hull, Kexgill was also shortlisted as a finalist in the Developer of the Year category. Richard Stott, Managing Director of Kexgill Group, also featured on a panel of speakers at the conference where he discussed the future of the student accommodation industry and trends for 2019. “The success of this project has been the culmination of years of hard work and collaboration between directors at the University and Kexgill. Property Week is the leading magazine in the commercial and residential property sector and to be named as a winner at such a prestigious national awards ceremony is a phenomenal achievement for not just the UQ team, but the Humber region as a whole. Kexgill’s £60m investment into the University Quarter provides students with the highest standards of student accommodation within a five-minute walk from the University campus. Judges praised the high quality of the accommodation; the levels of support University Quarter staff were able to provide and the UQ’s focus on safety and security with significant investment into CCTV, security patrols and a dedicated repairs app. “The safety and success of our students is the main priority at the University and we’re delighted to collaborate with an accommodation provider who shares our passion for this. This has resulted in the creation of a safe and secure environment allowing students to thrive in both their academic and social lives. “Forward lettings for 2019 are extremely positive and we believe this is thanks to providing students with optimum levels of support and the highest levels of quality accommodation less than five-minutes away from the University campus. We can’t wait to welcome our first wave of tenants into the UQ in September 2019 and we already have many exciting things planned for next year. All of the University Quarter Housing comes fully furnished and fitted with the latest technology including American fridge freezers. Rates are all-inclusive and include a cleaning service and unlimited ultra-fast Wi-Fi. UQ tenants also have access to their own dedicated repairs app, to quickly log and track any repairs with 24/7 support from maintenance staff. Students looking to learn more about the University Quarter including letting opportunities for 2019 can visit the official University Quarter website at http://universityquarter.co.uk/ or visit the UQ pod located on Salmon Grove to speak to members of the UQ team.